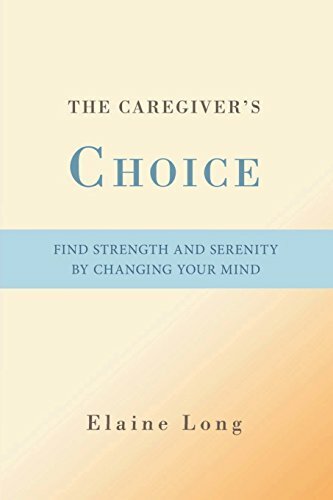 The Caregiver's Choice offers solid, uplifting advice presented in a compelling way as it presents the simple truths caregivers need to focus on in order to maintain a peaceful life despite the burden of caring for a loved one who cannot care for themselves.Elaine Long has been there-not once, but twice-and shares her personal experiences as a caregiver both to her mother and husband. Long infuses home-grown wisdom with an empathetic approach as she covers the broad mental and physical issues of caregiving such as learning to forgive family members, avoiding unfounded optimism, and battling gloom. Long includes the techniques and philosophies that provide caregivers internal strength and coping skills as they face common challenges. Caregivers will learn specifically how to:Find strength and support in othersDeal effectively with the medical communityFocus on one task at a timeRelease anger and guiltGrow with grief and find hopeThis powerful and valuable resource provides deep insight and an honest portrayal of the life of a caregiver, helping anyone caring for a dying loved one, whether in the home or in an outside facility, to find peace and joy in every day.